Where to Next for US-North Korea Talks? Can South Korean President Moon Jae-in save the moribund U.S.-North Korea diplomatic process? 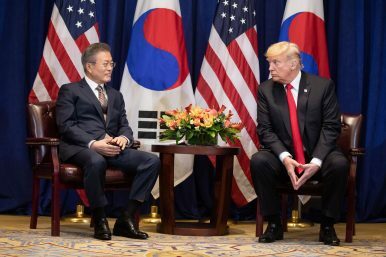 The Diplomat‘s Ankit Panda (@nktpnd) and Prashanth Parameswaran (@TheAsianist) discuss the state of U.S.-North Korea diplomacy and U.S.-South Korea relations. North Korea wants sanctions relief—and it wants it before it offers up anything more on denuclearization.